Objectives: Positron emission tomography (PET) scans have been used to investigate suspected metastatic lesions in colorectal cancer (CRC). We aimed to evaluate the correlation between CEA and PET scan results and to determine the role of PET CT in changing the management plan in patients with CRC. Methods and Procedure: Retrospective case series study has shown 33 patients who had PET CT in the year 2008-10. Data was collected from clinic letters, CT and PET scan reports, pathology results and double checked with patient’s case notes. Results: Out of these 33 patients, 27 patients were post operative on cancer surveillance and 6 patients were pre operative with a biopsy proven colorectal carcinoma. The patients age ranged between 43-85 yrs [19 male, 14 female]. CEA was raised in 17 patients and normal in 16 patients. Out of the 17 patients with raised CEA, 11 had positive PET scan result (64.7%), 5 had negative PET scan result (29.4) and 1 had equivocal result (5.9%). Out of the 16 patients who had normal CEA, 6 patients had positive PET scan result (37.5%), 7 had negative PET result (43.7%) and 3 patients had equivocal result (18.8%). Comparison of PET and CT scans have shown different results in18/ 33 patients (54.5%). PET scanning resulted in a change in management plan in15 patients (45.4%). Unnecessary surgery was avoided in 6 patients. PET scan showed a sensitivity of 85.7% and a specificity of 83.3%. 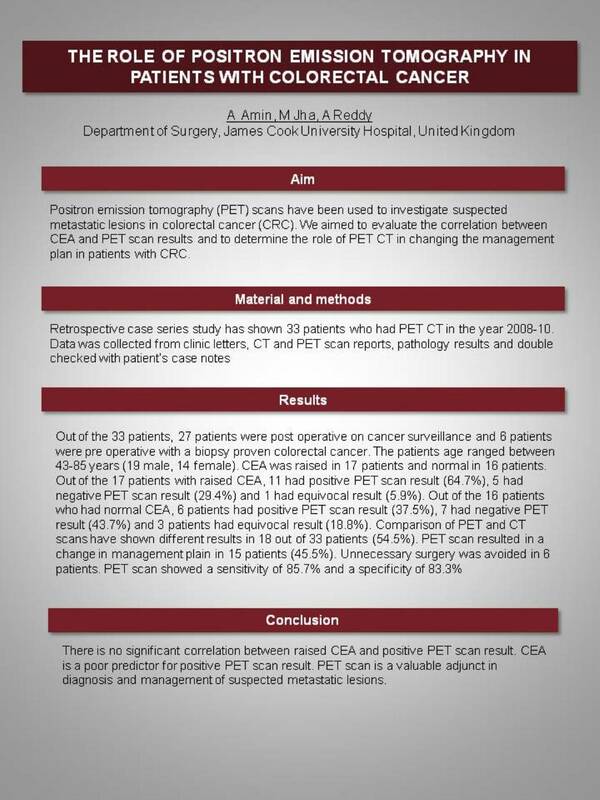 Conclusion: There is no significant correlation between raised CEA and positive PET scan result. CEA is a poor predictor for positive PET scan result. PET scan is a valuable adjunct in diagnosis and management of suspected metastatic lesions.